If passwords are stored in plain text format, they are vulnerable to cracking, unauthorized access, or tampering. To prevent this, cryptographic hashing algorithms can be used to securely store password hash digests. The recommended (and also default) hashing algorithm supported in IdM is SHA-512, which uses 64-bit words and also salt and stretching for extra security. To ensure backward compatibility, the SHA-256, DES, BigCrypt, and MD5 hashing algorithms are also supported. If you do not need backward compatibility, only use SHA-512 as it is more secure. The Local Authentication Options tab sets how local passwords are stored on the system. 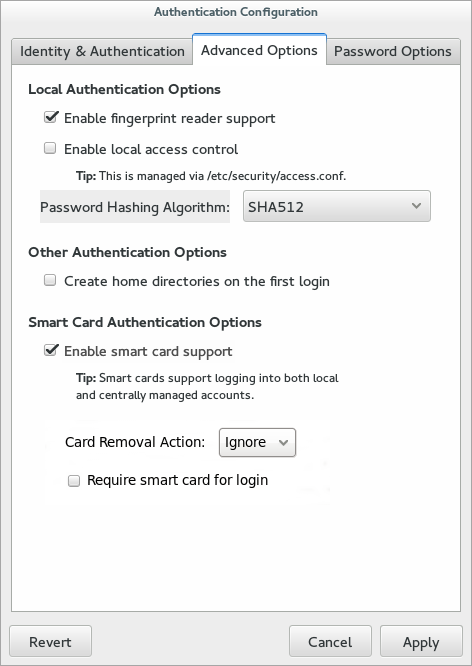 The Password Hashing Algorithm drop-down menu sets the algorithm to securely store passwords hashes. Open the authconfig UI, as in Section 2.2.3, “Launching the authconfig UI”. Select the algorithm to use in the Password Hashing Algorithm drop-down menu. Password complexity sets how strong a password must be for it to be allowed to be set for a local user account. Complexity is a combination of length and a variation of character classes. One way to look at it is that there are two parts to setting policy for complex passwords: identifying what types of characters can be used in a password (such as upper and lower case letters and special characters) and how those characters can be used within the password (how long must it be and how often can those characters be repeated). Open the Password Options tab. 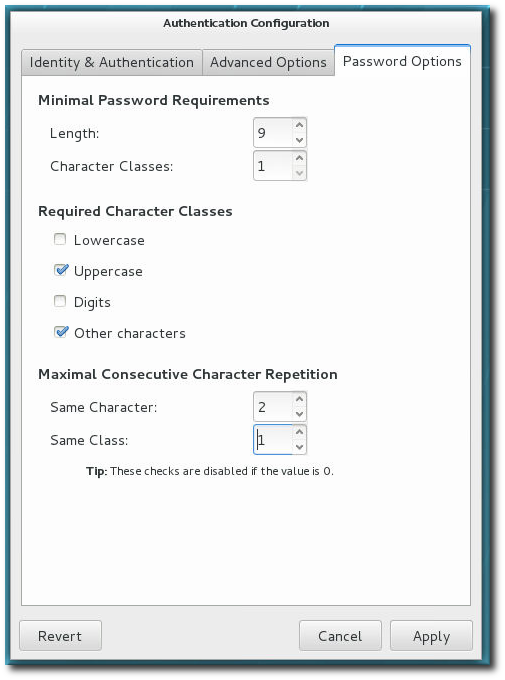 The minimum number of character classes which must be used in the password. Enable characters classes which must be used for passwords. For example, an uppercase letter can be used with any password, but if the Uppercase check box is selected, then an uppercase letter must be used in every password. For the Same Character field, this sets how often a single letter or character can be repeated. If this is set to 2, for example, then ssecret is allowed but sssecret is rejected. Likewise, Same Class sets a limit on how many times any character from a character class (uppercase, number, special character) can be repeated. If this is set to 3, for example, secret!! is allowed but secret!! @ or secret1234 would be rejected. The minimum number of different types of characters which must be used (--passminclass). The number of times a character can be repeated consecutively (--passmaxrepeat). Setting this to zero means there is no repeat limit. The number of time the same type of character (such as a number) can be used in a row (--passmaxclassrepeat). Setting this to zero means there is no repeat limit. For example, this sets a minimum length of nine characters, does not allow characters or classes to be repeated more than twice, and requires both uppercase and special characters.